In the winter of 1897, Hammond Fontenot led a secret expedition out through the gates of Belle La Vie and vanished. Now 77 years later in the winter of 1974, it is up to Armond Fontenot, along with his partner Private Detective Moses Byone, to answer the question of his great grandfather's disappearance. On the mysterious and deadly path that leads them deep into the heart of swamp country, Armond and Moses face a chilling discovery as they uncover the truth about Hammond's search for the Gold of the Lost Souls. Hammond Fontenoy had been thought to have died on a quest in India, but when his grandson, Armond, finds an old photograph taken at Belle la Vie after his time there and in the company of others dressed for a new, previously unknown, mission, the two detectives decide to find out what really happened to him. Apparently all of the men in the picture were never seen again after it was taken. Moses and Armond follow in his footsteps to Honey Island in their search for answers. But they are not alone: there are others interested in the long past fate of the adventurers. They are after treasure and are depending on being led to it by the two detectives. This is the second in the series featuring Armand Fontenoy and a follow-on companion to the New Orleans 'Voodoo Detective' Moses Byone books. It can, however, be read entirely as a stand alone. Both of the main protagonists are enjoyable characters, Moses the ex cop turned P.I. and Armond the flamboyant antiques dealer with a penchant for adventure. The well crafted story, although similar to other treasure hunt thriller books, is exciting and the narration by Nicholas Patrella, who has become for this reader, the voice of all of the series, is well suited to the flavour of the text - fast paced, with differentiating character dialogue and with an ease of incorporating the foreign language names and snippets of conversation. Overall, another enjoyable book by author, Ricardo M.Fleshman. 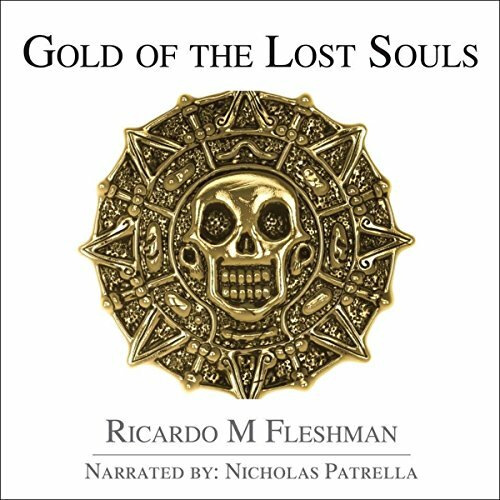 My thanks to the rights holder of Gold of Lost Souls, who, at my request, freely gifted me a complimentary copy, via Audiobook Boom. I look forward to more stories about this quirky and colourful couple. Narration of this book has the same problem that the first book had. The narrator read the book very fast, overshooting the pace of the story. It didn't feel like a story-teller is telling me a thrilling story. It felt more like listening to a fast-forward reel. The narrator should've varied his reading speed based on the tempo of the chapter being read. This second book is moderately better than the first book. Both books are more or less same, having same strong qualities (scene setup) and same drawbacks (narration). Where book two excels in comparison is the story. First book's story had gone stale after initial chapters, but this book manages to keep going. It's still not as unique and yet thrilling I would've wanted it to be, but seeing that the plot is improving in this book makes me hopeful that the author's next book will be even better.